Over the next 60 months, Santel will be adding “575” miles of fiber cable capable of handling speeds of up to a Gigabit (1,000 Mbps) for each patron. The new service, FiberMaxx, means Maximum Internet. “Our goal is to connect farms, homes and businesses within our service area to a fiber network able to move data as quickly as any big city in the US,” said Thompson. Fiber optic networks are known to be the fastest, most reliable, long-term cost-effective method for delivering broadband Internet over long distances. Through FTTH (Fiber to the Home), Santel strives to connect the divide that currently leaves millions of rural Americans with an Internet connection unable to keep up with modern needs. Thanks to the District 20 representatives and candidates, for attending and supporting the positive economic impact on their constituents. District 20 is in Aurora County on the West side of the Santel Territory. Kristie, expresses her support for Santel’s investment into the network. Due to the positive economic impact it will have on the rural communities. Kristie Fiegen, Chairperson of Public Utilities Commission and Ryan Thompson, GM at Santel discuss implementation map for FiberMaxx Maximum Internet. 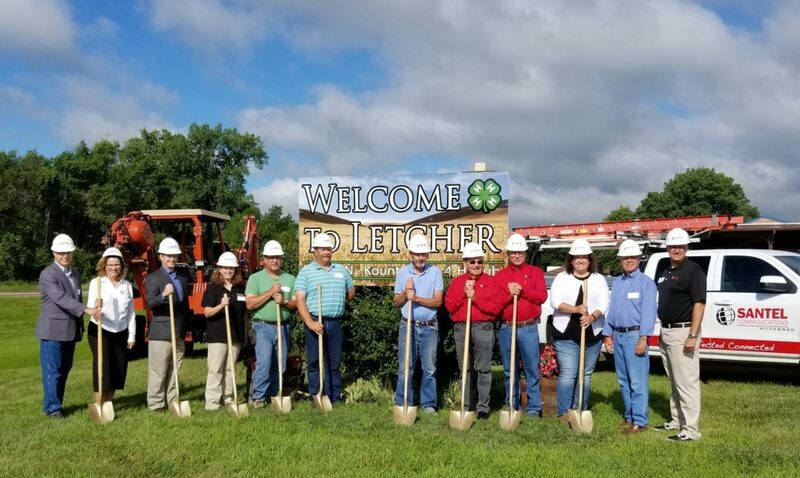 Jim Fiala, Governors Council of Economic Development (GEOD), Discusses with Letcher Community Development Foundation how Santel’s fiber optics installation improves the state’s ability to bring new business and industry into the state and into the local areas. Ben Ready, SE District Director for Senator John Thune, talks of Senator Thune’s support for investment included that of Santel. Santel will be updating coop patrons individually on the project as it moves forward. Updates are also available at www.santel.coop/serviceareas , specifically detailing the progress of FiberMaxx. Ryan Thompson, GM of Santel Communications, opening the Big Dig ceremony.